In November 2015, when James and Sara were on their first trip to Haiti to help build a school, they did not realize it would lead them to a much larger mission. "When Sara and I were asked to help build a school, we both said ‘yes’ immediately. We didn’t have to think about it. If the children needed it, we will do it. As business owners in upstate New York, we normally analyze everything in terms of cost-benefit. In this situation, when it came helping these children, it felt like second nature. We just went. It was clear that we were both finding our larger purpose. It was during that first trip that the we learned that the schools in the area only had enough funds to feed the children every other day. And school was often the only place where kids were fed at all. There’s a saying in Haiti, “hungry bellies, have no ears.” When a child is hungry, they are unable to learn. Every child deserves a meal and a chance to reach their God-given potential. That’s when we decided we wanted to help on a larger scale. I immediately thought about my mother. I was brought up in a house where my mom would buy wheat in buckets, and she would grind the wheat and bake bread every day. Breads made from fresh-ground ingredients contain every essential vitamin and nutrient that the human body needs. I immediately began to think about how I could help feed these kids by baking bread. Find out more about why we chose whole wheat bread HERE. First, we needed an oven. It needed to be simply built with available materials. And it had to be able to get to 350 degrees – the temperature I needed to bake the bread. We enlisted the help of a family member, a mason by trade, to create a design that was inexpensive, durable and something I could build quickly. I had to see if I could actually get this thing off the ground. The prototype was an 8-foot by 4-foot block structure fueled by propane. When we made our first bread, It came out like cake. It was awesome, and the kids loved it. We had the model. 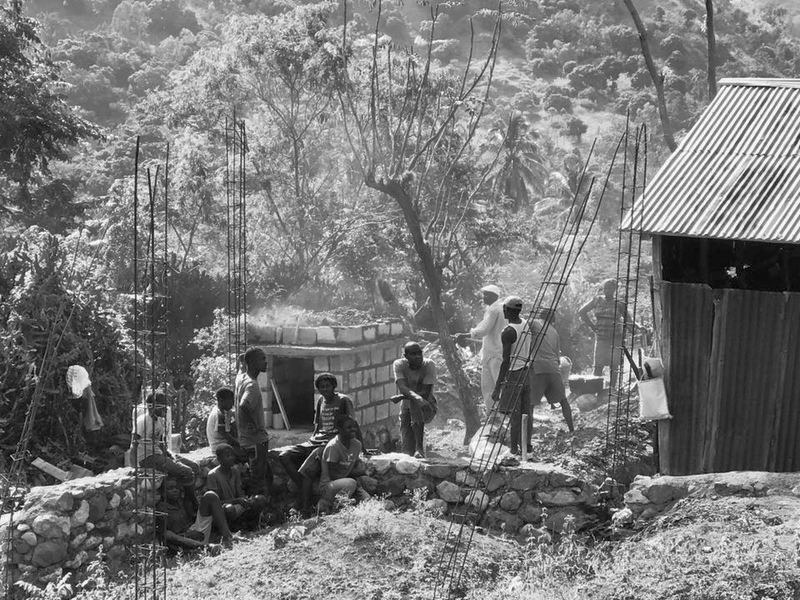 On our next trip to Haiti, we built four ovens in four days. We had the recipe for the bread and the ovens to get started. The next challenge was finding wheat and getting it to Haiti. There was no wheat available for us in Haiti. It would have to come from the U.S.
After numerous attempts to buy wholesale from farmers across the country, we turned to Sue Becker, founder of The Bread Beckers. The organization travels the United States educating the public on the health benefits of making your own bread from whole grains. We bought enough ingredients from town to get the schools through the last two months of classes. We returned to home with a goal of getting 30,000 pounds of wheat back down to Haiti by the time school started again in the fall. If you rent a shipping container, whether you put 10 pounds in it or 40,000 pounds in it, it is going to be the same shipping price. We are now feeding over 3,000 kids, and we’ve created hundreds of jobs by paying cooks and teachers to feed the children every single day. The parents say that when the children eat the bread. They no longer complain about being hungry. That is pleasant to hear. The kids were malnourished. Their hair was turning red. Eating this bread, they started to become healthy. The results are powerful. And it’s sustainable.